GOOD ONYA Kipper1258!! CONGRATULATIONS azur! It has been another very enjoyable series of races from SSANZ - there’s something very sailable about this Safety at Sea Two-Handed Triple Series – like the childrens’ story “Goldilocks” they are usually just right, although occasionally, to be fair, if winds are particularly light and fickle they can turn into nightmares. Either way, we become more familiar with the waters and islands off Auckland! It is thanks to Sailonline’s association with SSANZ and, of course, with the Young 88 Association that we can truly feel at home here in New Zealand, and I am sure that there are many of us more familiar now with the islands of the Hauraki Gulf than we are with those of our own countries! Admittedly, from the comfort of our armchairs, we don’t have tides or currents to contend with, but this really doesn’t lessen the enjoyment of directly competing with real racers! Here are the SSANZ Results. 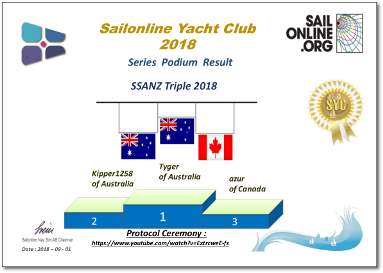 Sailonline’s series podium are to be congratulated on taking the top three places in this epic series – very well done guys!